I’ve been called a comeflor. Often. It’s a venezuelan word –which you probably won’t find in many dictionaries- literally translatable as “flower-eater”, and meaning naïve or idealist. I guess it comes from believing -probably quite naïvely- that idealists sit in contemplation while munching on the sexual organs of plants. In any case, I was rightly called comeflor due to idealism naïvety some years ago. Now, however, I may have become too cynic to be considered naïve—although one never knows. But comeflor still describes me. I do like eating flowers. I’ll start with the one I probably eat most often. 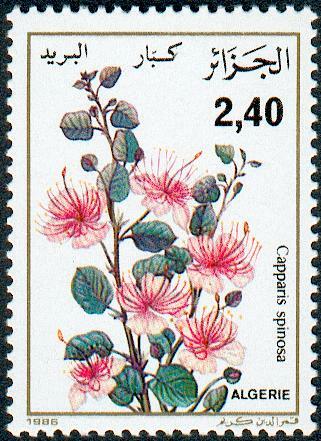 Capparis spinosa, the Caper. This tipically mediterranean ingredient was already used in ancient greece (and probably before that…). It may have started its way into our modern palates due to its mainly digestive properties (real or traditional). Probably as a carminative (that which prevents the windy shame and is thus very welcome when sharing food with friends). The plant seems to have originated, however, in the dry areas of Central or Western Asia. It is a perennial shrub, very resistant to drought and changes in temperature, and produces gorgeous showy flowers with a mild sweet scent. The name caper comes via latin from the greek kapparis, caper (how interesting…). Etymologists are divided as to whether kapparis comes from some asian word (thus hinting at a historical import of the plant) or refers to Cyprus, that controversial island where capers appear to abound massively. Maybe it is the sun they accumulate, or that tangy, slightly fishy (good fishy) taste from sea-sprayed airs, but they do bring a flavour of holidays and summer to anything I dress with them. To be precise, it is not the flower-flower (that’s a botanical term) we eat, but the un-opened flower buds. As they are supposedly too bitter to be eaten directly, they are processed in a vinegar or vinegar/salt solution. This apparently brings out the distinctive pungent flavour of good capers (the bad ones just taste of salty vinegar), which is mainly produced by a mustard oil (methyl isothiocyanate) and a flavoniod (rutin). It has been claimed that the umami (I call it fishy) flavour comes from the presence of capric fatty acid (but see discussion here). I hope this remains true, because, although one may have thought otherwise, the name “capric” in the fatty acid has nothing to do with “caper”. It comes from the Latin capris, goat. What if “caper” actually comes from “goat”? And why not? Both inhabit arid, tough environments, are stubborn, somewhat cute, delicious, and I would like to have them in my balcony. The flavour of capers vary greatly not only with the preparation, but also with the region they’re grown in. Those from the far island of Pantelleria seem to be exquisite. Although not pertinent to this floral post, the caper berry (a true berry, even) is also eaten pickled (and yummy too), and the young leaves are used (at least in some Mediterranean islands) in salads. It looks like the plant could grow in my very dry and plant-loathing balcony, so maybe in a couple of years I will be able to have a caper salad! And what about the frolicking type? I believe the name comes from the effect culinary capers have on people: they make one happy and prone to foolish behaviour. No, seriously, in this case we go back to goats again. The frolicking capers come from capriolare, which in turns comes from capris, goat. Here a funny (probably) and very long discourse on the Caper Berry of ancient science. Here an article (in German) about the capers of Pantelleria.